The agonic is a line on a global map along which the directions to true north and local magnetic north coincide. In other words it is where magnetic declination, sometimes simply referred to as magnetic variation, is zero. 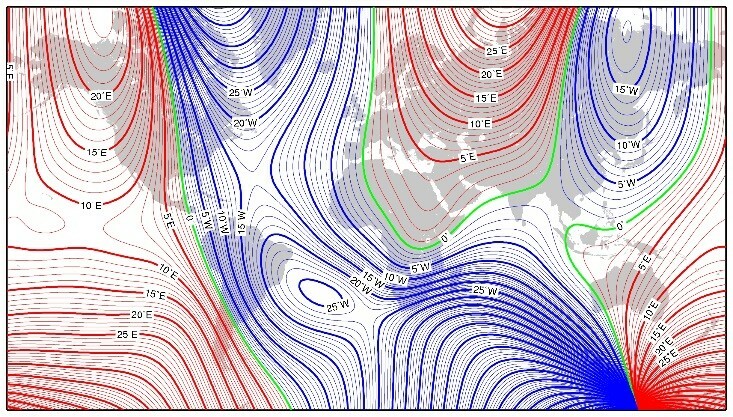 The global map shows declination from the World Magnetic Model at 2015.0. Shown in green is the agonic line. 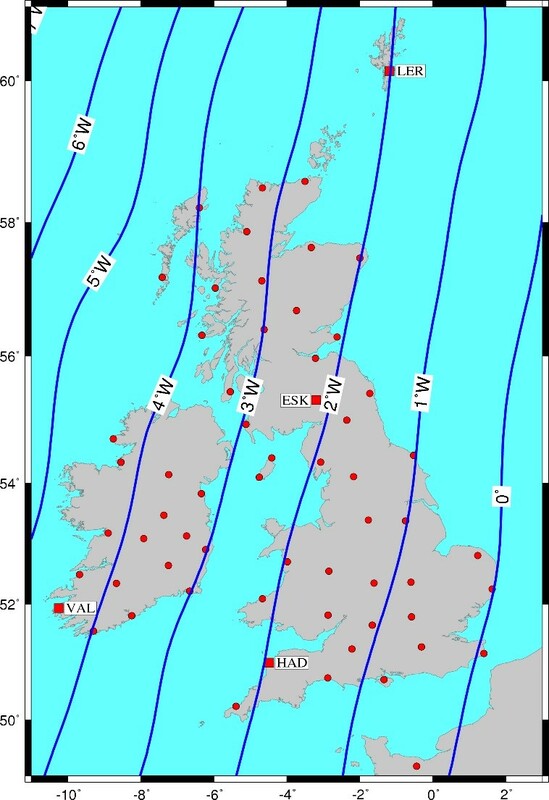 For the past 350 years in the UK and Ireland declination has been westerly (magnetic north west of true north) and the agonic line has been advancing from the east. 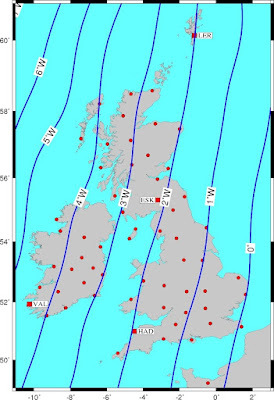 In 2017 the agonic line arrived at East Anglia and Kent and is due to pass slowly over the British Isles during the next few years with declination becoming easterly behind it. Susan Macmillan of the Geomagnetism Team explains a little more. 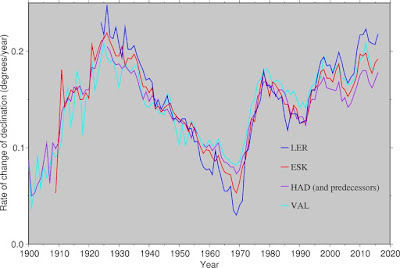 At the BGS regional and global models of the Earth’s magnetic field are derived every year to keep accurate track of the slow changes in the Earth’s magnetic field. These models use data from observatories, satellites and repeat stations and are widely used for navigation and orientation. The map shows how declination currently varies across the UK and Ireland in more detail than the global map. Also shown are locations of ground-based observatories and repeat stations. The BGS run Lerwick (LER), Eskdalemuir (ESK) and Hartland (HAD) observatories and UK repeat station network and Met Éireann runs Valentia (VAL) and Irish repeat station network. What is causing this gradual change in direction of magnetic north? The Earth’s magnetic field is sustained by a dynamo process in the liquid outer core of the Earth. Interactions between the flow of the molten iron-rich material in this region and the magnetic field generate electrical current that, in turn, creates new magnetic field which sustains the field. Energy sources for the fluid motions are primarily convection - as the Earth slowly cools down, warmer fluid ascends and cooler fluid descends and solidifies onto the inner core. This in turn changes the chemical composition of the fluid, and buoyancy forces result. The effect of these deep Earth processes on declination at the four observatories in the UK and Ireland can be seen in the graph. 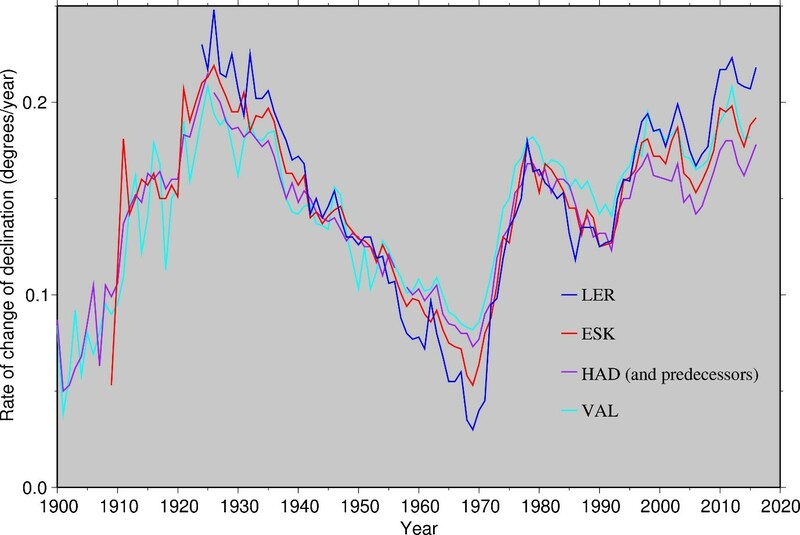 Note several sharp changes in trend in this graph, for example at 1925, 1969 and 1979. The cause of these so-called geomagnetic jerks is not fully understood. What does this mean for compass users in the British Isles? The advance of the agonic line to the UK and Ireland will affect compass users when swapping between map bearings and magnetic bearings. A common mnemonic to help remember whether to add or subtract magnetic variation when converting from map bearings to magnetic bearings is “East is least, west is best”. This mnemonic is applicable for any type of map and anywhere in the world, no matter whether the north lines on the map are true north lines or grid north lines or whether magnetic north is west or east of map north. “Least” in this context means “subtract” and “best” means “add”. If converting from magnetic bearings to map bearings, as one would if locating one’s position on a map using back bearings from known features, the sense of the correction should be reversed. Some mnemonics, however, will no longer work when magnetic variation is easterly. Examples of mnemonics which are soon to be redundant in the UK and Ireland are “grid to mag, add - mag to grid, get rid” and “MMM (Magnetic to Map Minus)” – can you think of others?